A Ulysses family is outraged after game wardens killed a deer that was allowed inside their house and took walks with the family. 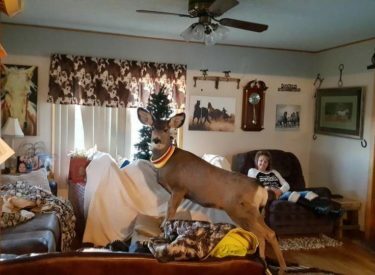 Kim Mcgaughey, of rural Ulysses, described the deer as “very much a big pet.” The 2-year-old mule deer was named Faline, after Bambi’s friend and future mate in the cartoon movie. But it’s illegal to keep a wild animal as a pet in Kansas, and wildlife officials said something had to be done. The Kansas Department of Wildlife, Parks and Tourism says pet deer have killed at least two people. The department said it was trying to protect people from being physically injured by the deer, and eliminate the possibility of disease being passed to humans, livestock and other deer.